The house deserves an advent wreath. A thank you. A welcome. Mine was made by Jane Scotter of Fern Verrow, the biodynamic farm at the foot of the Black Mountains in Wales. 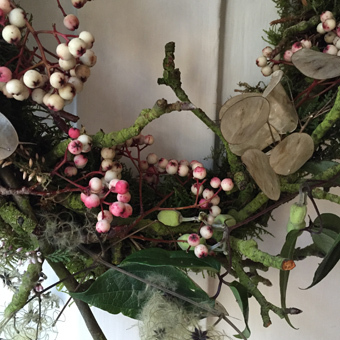 It is made from twigs, lichen, moss, old man's beard, berries and honesty. It hung on the kitchen door for a while, then I moved it to the front door where it has stayed all Christmas, except for the two hours every other day, when I take it down and soak it, to keep the moss alive. It will end up in the garden. I like the fact that the wreath is made mostly from found objects, twigs from the forest floor, honesty from the Fern Verrow garden. Hedgerow finds. It suits this old house. Hanging on the front door, it tends to polarise passers by. A bit like me really. Amused laughter (that'll be the shiny laurels and red ribbon brigade) or the click of cameras from those who understand and appreciate its wild, organic soul. 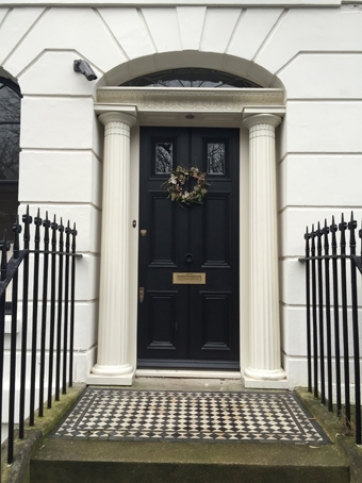 One who certainly understood the wreath's charms has been the gardener Arabella Sock who writes the delightful blog A Sea of Immeasurable Gravy. Her tweets (@arabellasock) are one of the joys of my gardening life. 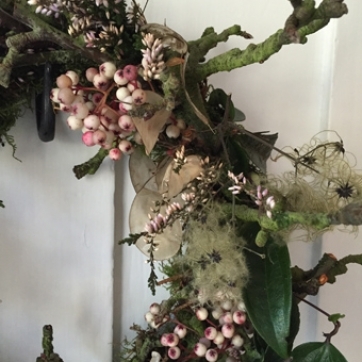 I was thrilled that it was her wreath of the year, all the more amazing as it was up against some other beautiful, thoughtful examples, including some made from seashore flotsam and jetsam. It may be my imagination, but the habit of hanging something on the front door in this manner is getting more popular here. Not usually a great one for decorations, the Advent wreath is something I would love to see more of. I almost don't want to take this one down. It has a certain magic. It could, one suspects have been made by faeries. I like to think they had a hand in it.